A toast to the many 417-land cocktail connoisseurs, spirit specialists and drink destinations that are making our corner of the state a more intoxicating place than ever. Let a Barley Wheat & Rye bartender pour you a tantalizing taste of creative and well-crafted cocktails like a classic Manhattan, the P.O.T.U.S., a daiquiri or a Sazerac. Our region has always been home to some great watering holes where 417-landers can sidle up to the bar and knock back a cold one. But just as the region’s restaurant landscape has progressed over the years, so too has our bar scene, driven in part by the modern cocktail renaissance that’s sweeping through other major cities. 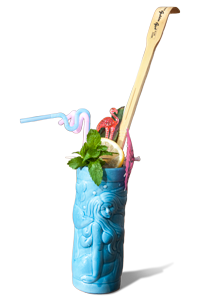 From a trendy tiki bar and a scotch-focused gem to the classic establishments that paved the way for those newcomers, cool local spots are setting a high bar with all kinds of inventive, elevated boozy offerings. And bibulous barkeeps, vintners, brewers and distillers are pushing boundaries and embracing artistry, craftsmanship and creativity like never before. So join us as we toast the many 417-land cocktail connoisseurs, spirit specialists and drink destinations that are making our corner of the state a more intoxicating place than ever. Bartender Michah Wood infuses Missouri Spirits bourbon with hot chili peppers and sweet dark chocolate cream and then tops it with fresh mint to create the Mexican Villain. Plenty of terrific watering holes offer a cool atmosphere and creative cocktails with high-quality ingredients. But only a few make the very spirits incorporated in their libations. Missouri Spirits is one such spot. Evidence of their craft—the sweet, earthy smell of bourbon aging in Missouri white oak barrels—welcomes you as soon as you enter the distillery’s large, hospitable tasting room housed in the front portion of its home base, a former auto body shop in downtown Springfield. 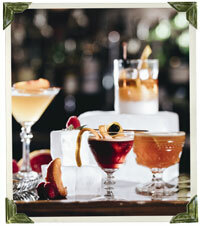 The liquors made on site are, unsurprisingly, the centerpiece of the array of cocktails, which spans classics (Old Fashioneds, Manhattans and the like) and imaginative signature cocktails dreamed up by founder Scott Shotts and his team. “We’re always playing around and experimenting,” he says. 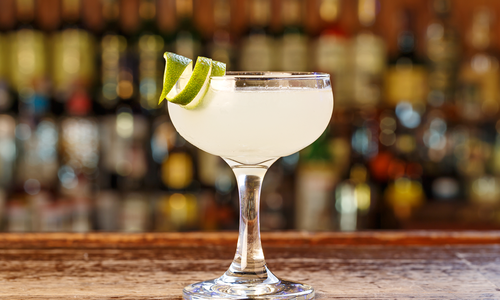 To sample those exploits, saunter up to the steel-topped bar and order the martini-style Mexican Villain. Named as a nod to the beloved Springfield restaurant chain, it features house-made dark chocolate cream, mint, cinnamon and Missouri Spirits bourbon that’s been infused with blistering-hot chili peppers. Be forewarned: You may want to have a glass of water handy if you try this tipple. “It’s got a spicy kick on the back end,” Shotts says. Another must-try is the ultra-popular Bill’s Bullets featuring Missouri Spirits bourbon, lemon juice, smoked ice and a flavor-packed red apple and tobacco shrub, which takes three to four days to make. 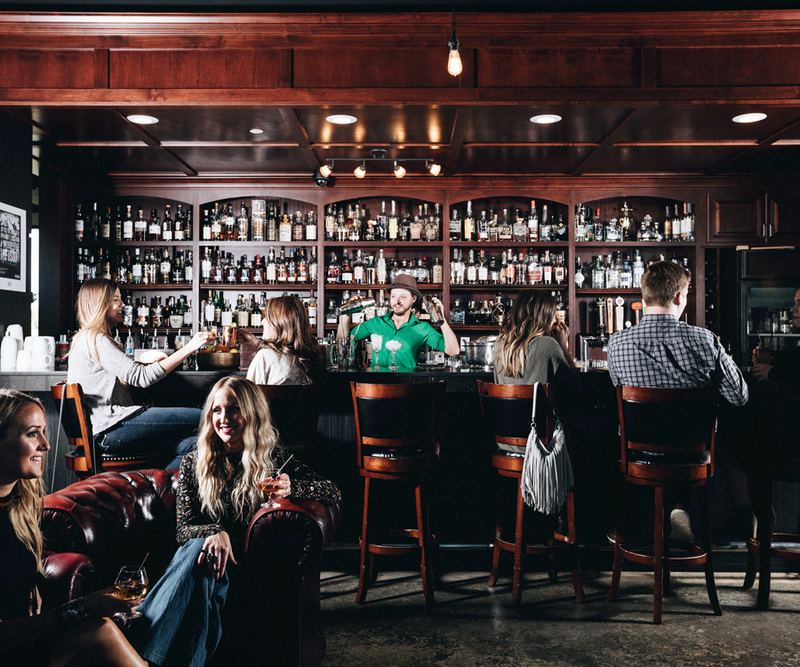 Although such craftsmanship and skill are central to the Missouri Spirits experience, the atmosphere is decidedly casual and welcoming, a draw for the eclectic mix of people that frequent it. “We want people to feel comfortable,” Shotts says. “Cocktails can feel very intimidating. What we try to do is take that away. We want people to enjoy them. If you want a Missouri Spirits bourbon and Coke, that’s not going to offend us. But if you want the high-end [cocktails] with different levels of flavor profiles, we are going to give that to you. That’s important to us. Are you a lady? Do you love cocktails? If so, be sure not to miss the next Cocktail on the Farm night at Urban Roots Farm. Hosted by a rotating roster of mixologists, this ladies-only event is the perfect mixture of education and fun all rolled into one picturesque evening. Throughout the night, you’ll have the opportunity to make and enjoy three cocktails, nibble on some tasty small plates, bask in front of a fire pit and stroll through the fields and greenhouses. If you haven’t yet had a chance to visit Urban Roots Farm, this is the best excuse to make some time to explore this enchanting farm nestled in Springfield’s West Central neighborhood. Once you step off the street and onto the farm you’ll feel instantly transported out of the city. 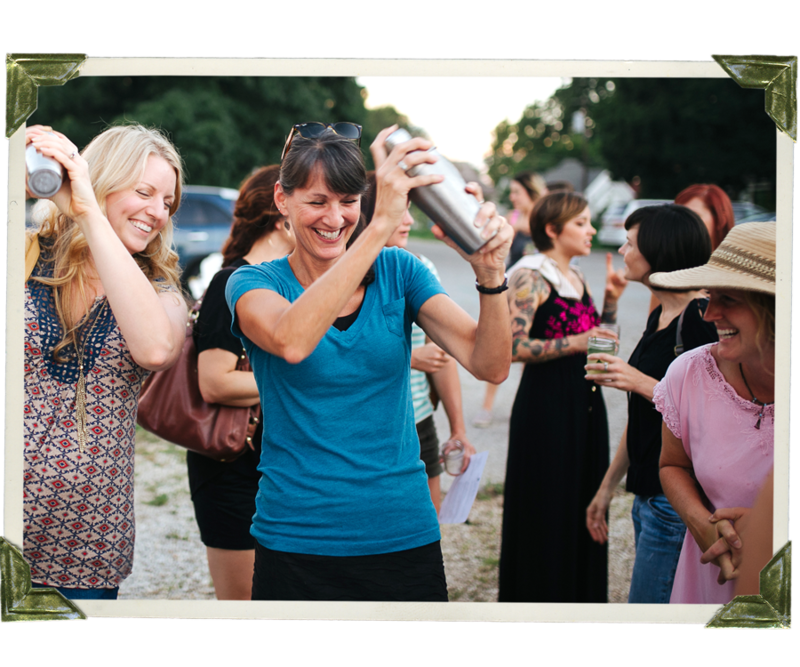 Originally created in 2015 by Mallory Leicht, the blogger behind Chase the Flavor, Cocktails on the Farm was envisioned as a way for women to learn about cocktails in a relaxed and encouraging environment. At stations, learn to make each drink and take home a recipe card so you can recreate your favorites at home. Currently, Cocktails on the Farm is hibernating for the winter, but be sure to watch Facebook when the weather turns warmer. Free tours, weekends at noon, 2 p.m. and 4 p.m.
Bar open Sat.–Sun., noon–6 p.m., live music, 2–5 p.m. 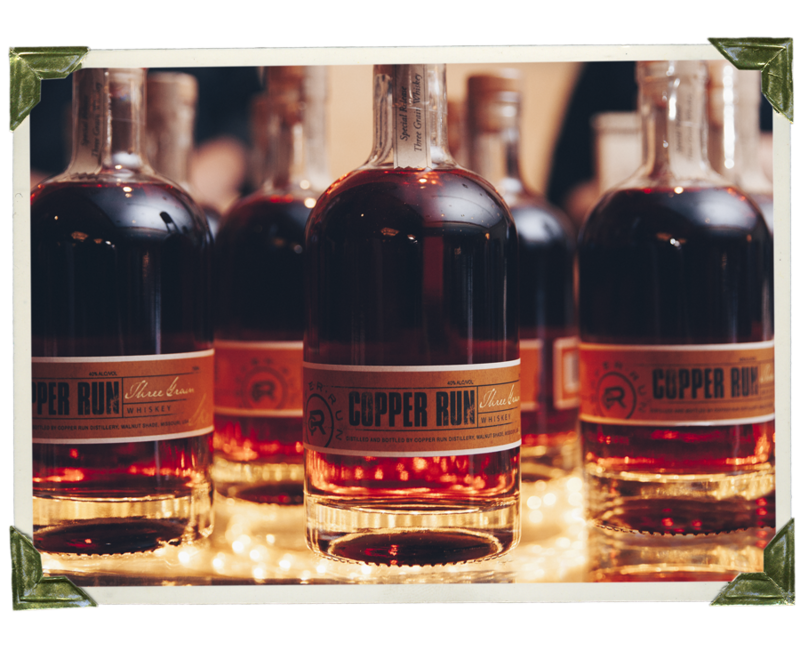 The next time you’re looking to while away a weekend afternoon in a moonshine-fueled haze, consider heading to Copper Run Distillery in Walnut Shade. The distillery is the work of Jim Blansit, who began making moonshine in his basement 20 years ago. Today Copper Run is not only churning out barrels of booze, but it also boasts a full bar that is open on Saturdays and Sundays and is available for private parties during the week. Stop by on the weekends, and catch a tour narrated by Blansit where you can learn about the distilling process. After you’ve seen behind the scenes, relax and enjoy live music. If the weather is nice, be sure to grab a seat on the large deck that overlooks the surrounding woods. In chillier months, snag a seat at the bar. No matter what Mother Nature is doing, Copper Run offers up cocktail options that are sure to satisfy even the most discerning palate. 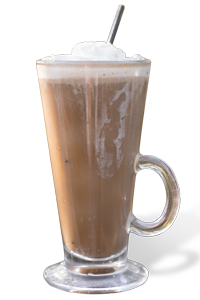 We’re partial to the Ozarks Winter Warmer on cold days, which is made with espresso-infused rum, coffee and cream. The Moonshine Mary is also good. The drink substitutes moonshine for vodka for an Ozarkian twist. There’s plenty to enjoy at Copper Run, just remember to bring a designated driver. Opened last August by Jeremy Smith and Cody Smith of City Butcher, CB Social House is all about balance. The offerings are thoughtful but not pretentious. Straightforward but not mundane. Traditional but with modern elements. And the bar program—built on handmade ingredients, unique whiskeys and well-crafted classic drinks—nimbly executes that tightrope-walking philosophy. As such, most of the drinks feature relatively few ingredients, typically around five, but each is studiously chosen and treated with care and attention to detail. 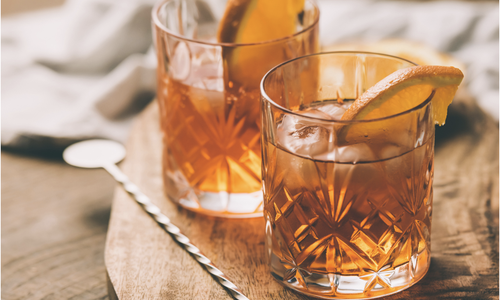 The house Old Fashioned is one example, incorporating Rittenhouse rye whiskey, a mix of bitters and two spoonfuls of demerara sugar. Served in a chilled lowball glass with a large ice cube and flag of orange peel, the final product is simple, whiskey-forward and “not far off from an Old Fashioned that you’d get in 1860s Chicago,” he says. It’s easy to envision what life would have felt like then when sitting in CB’s dusky, stylish setting that features elements such as exposed brick, weathered wood floors and photos of Prohibition-era revelry. There’s also a hum of activity—clinking glasses, laughter floating up from a first-floor bar area, the kitchen staff and bartenders trading jokes across the main dining room. While sipping a drink at The Order’s bar or in the elegant, eclectic lobby of Hotel Vandivort, it’s easy to imagine yourself in a stylish major city like New York or San Francisco. 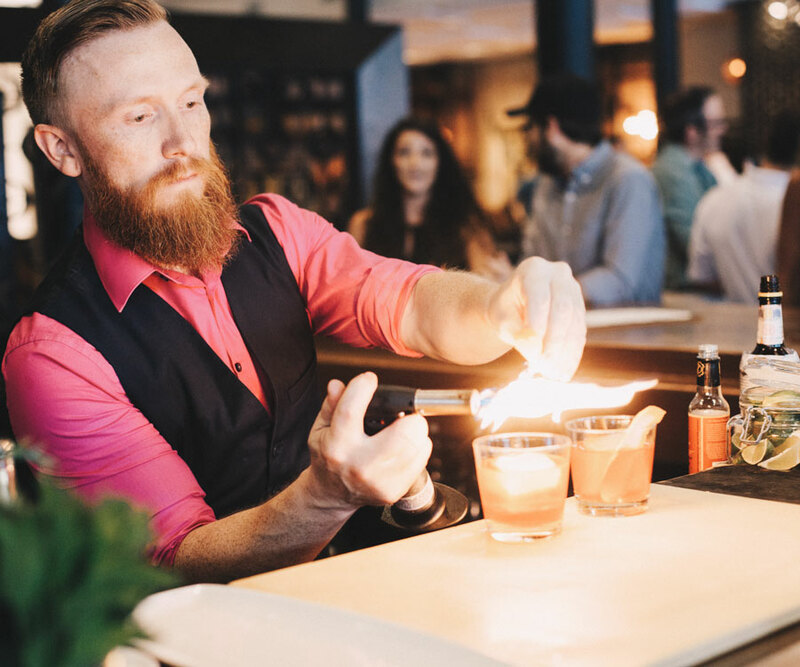 “One of the great things about working here is that you hear that all the time,” says Restaurant Manager Dylan Rauhoff, who helped pioneer the spot’s wide-ranging cocktail program when it first opened. Although the experience is certainly urbane and transportive, it’s also deeply rooted in Springfield history and culture. “When someone comes down, we say, ‘Here is Springfield’ with our beer list, the cocktails we make, the bourbon, the vodka and just the overall experience,” Rauhoff says. Some drinks draw on local lore, like the recent 1918 cocktail, referencing the famous Springfield fire that happened that year, with a torched strawberry shrub. 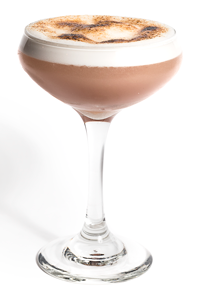 Numerous others prominently feature local ingredients, like the Askinosie Chocolate–infused rum incorporated in the Taste of Siam. Presenting visitors with cutting-edge finds from other parts of the country is woven into the bar philosophy. For example, there’s the eye-catching Porthole, a glass and stainless steel cocktail infuser originally created for the bartenders of The Aviary in Chicago. When you order the teapot-like vessel, it’s filled with a rotating mix of ingredients that infuse tableside. After a few minutes, a flavorful, boozy filtered drink is ready to be sipped. 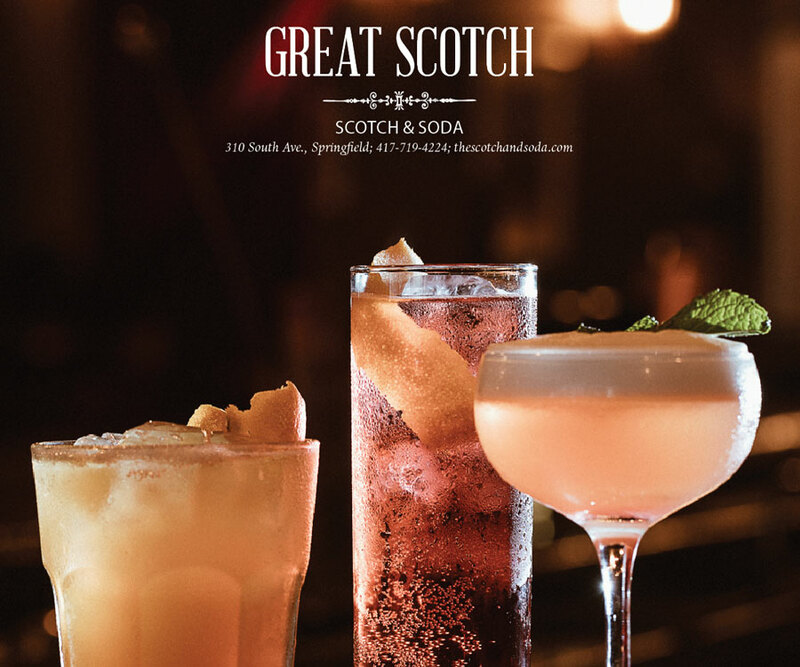 Many people credit Scotch & Soda for jump-starting Springfield’s cocktail revival with its carefully crafted drinks. Made with Four Roses Yellow, The Gala incorporates a nice spice through its house cinnamon simple syrup and Regan’s Orange Bitters. 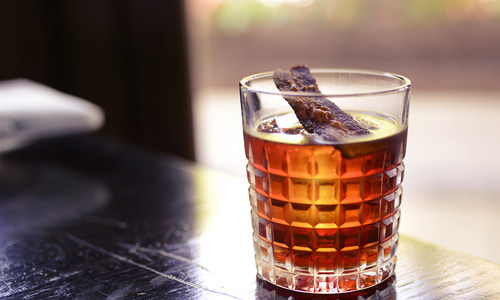 Try an old-school Americano, a balanced blend of sweet vermouth, Campari and soda. You can order the Lucky Kitty, which has house strawberry-infused sake and Lillet Rose, two ways: a light and fruity beverage or a stronger, boozier version. Springfield's bar scene has a place to embrace every mood. 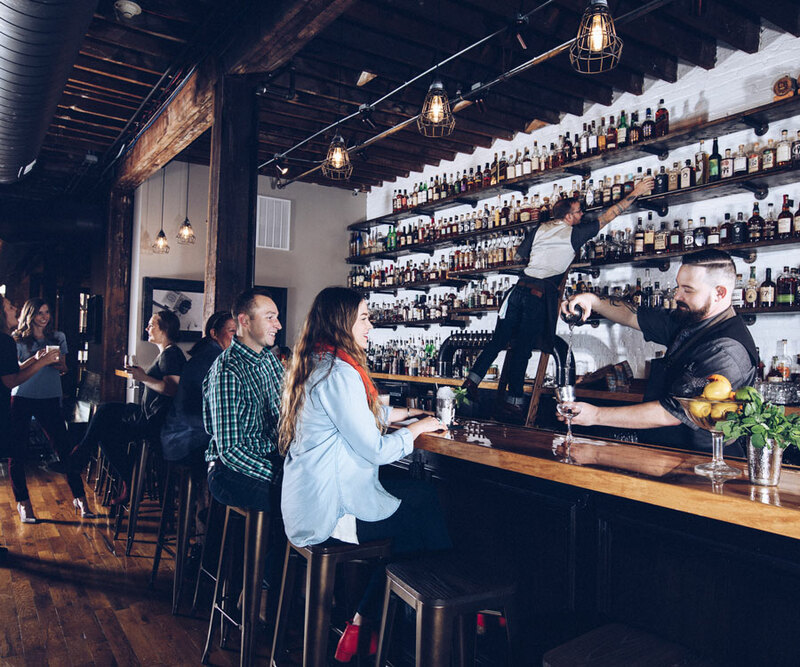 Explore some of the city's most popular hangouts for imbibing. 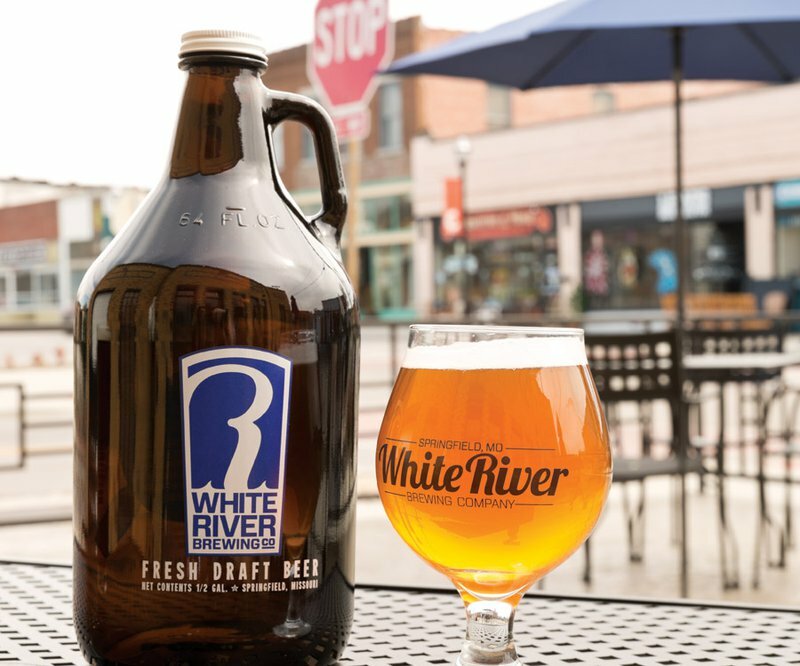 White River Brewing Company (505 W. Commercial St., Springfield; 417-869-1366) cranks out European-style beers with an Ozarks twist. The facility was purchased by John “Buz” Hosfield—who still serves as proprietor—in 2007, officially becoming White River Brewing Company in 2012. The small-batch brewery shipped its first kegs in 2013, and the Commercial Street favorite has been churning out no-frills goodness ever since. The brewery prides itself on “beers brewed strong” in the European tradition, perfect whether you’re looking to expand your palate or enjoy a weekend on the river. White River also hosts family-friendly events that are just as fun as the brewery itself. Catch a White River beer yoga class—also known as WROGA—or one of the brewery’s recreational events like craft beer bowling. What’s in season now: Coconut Rye Porter. This winter seasonal is made with toasted coconut flakes and a rye malt, which achieve the perfect balance for a supremely drinkable dark beer. Springfield Brewing Company (305 S. Market Ave., Springfield; 417-832-8277) is a 417-land tradition. The downtown landmark has been producing unique, drinkable beers since 1997 when the Paul Mueller Company purchased the building to house its brewery tanks. From Brew Co.’s inception, the goal was to create the community’s first real brewpub experience. 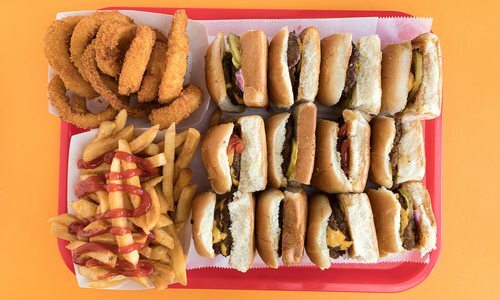 The bustling spot has achieved that goal, boasting equally solid food and beer menus even after changing ownership in 2011. Can’t get enough of Brew Co.’s traditional English, German and American-style ales and lagers? Guests can order a six pack or a keg to-go. What’s in season now: Balter Barleywine. This new brew is “pure liquid dessert,” marrying notes of burnt sugar and toffee with the sweet spiciness of rye whiskey. The mother of Springfield’s downtown breweries, Mother’s Brewing Company (215 S. Grant Ave., Springfield; 417-862-0423), is booming. In 2012, the Brewers Association named Mother’s the seventh fastest-growing craft brewery in the nation. Why the buzz? Founder Jeff Schrag, head brewer David Soper and their kooky team of Mother’s lovers combine an array of coastal flavors and innovative techniques to create a family of beers unlike any other. The brewery’s style is playful with an ever-changing lineup of creative brews. 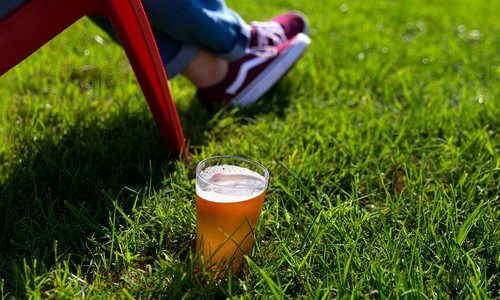 Events held in the Mother’s Backyard behind the brewery are always a hit, and the taproom is a spot for those looking to tantalize their taste buds. Free brewery tours are available on Saturdays. Want a taste? Check out the annual Mother’s Day and Oktoberfest festivals, or swing by a First Firkin Friday during a First Friday Art Walk. What’s in season now: Winter Grind. It’s the perfect American coffee stout made with a cold-brewed espresso blend from Mudhouse Coffee. Piney River Brewing Company (15194 Walnut Grove Drive, Bucyrus; 417-967-4001) is the quintessential Ozarks brewery. Owners Joleen and Brian Durham started as experienced home brewers, making beer on their kitchen stove and fermenting it in the basement of their historic farmhouse. Then, in 2010, their hobby became something much bigger. The couple revived their 70-year-old barn, and Piney River Brewing Company was born. Piney River became the first brewery in Missouri to can its beer in-house at the brewery, making it easy to put the product on store shelves. Today, Piney River puts out innovative, Missouri-inspired brews such as the popular Float Trip Ale. The restored BARn tap room is open on weekends, and the beers are also available in stores and restaurants throughout the Ozarks. What’s in season now: Choose from two winter seasonals at Piney River: The Masked Bandit, a black rye IPA, and Raise a Ruckus, a Russian imperial stout featuring vanilla and coffee from the experts at Brick & Mortar. The wine from this spot is created a bit differently: OOVVDA offers nearly all of its wines bottled in both sweet and dry versions. A favorite is the peach melba made with fermented peaches and raspberries and a hint of vanilla. Customers also love the cherry wine made with pie cherries. Try these and other favorites in the tasting room. Just a quick drive north of Springfield brings you to Tyler Ridge Vineyard Winery, where you can sample some fine wines in a refurbished 112-year-old farmhouse. Guests are welcome to walk around the vineyard and pack a picnic to hang for the entire day. The winery is open on weekends from May through October. Sure, 7C’s has wine. They have plenty of wine. But the winery also has several types of mead—including a gold medal–winning alfalfa mead—that it can’t make fast enough. Stop by for a taste of the delicious stuff, then leave with some of the spot’s wine, which is packaged in recyclable pouches. It’s portable and oh-so-convenient! Whether you like your wine dry or sweet or red or white, Lindwedel Winery has plenty that’ll please your palate. The winery is closed in January and February, but starting in March, enjoy a few samples in the tasting room. Then post up on the patio to enjoy some vino with a view. There’s live music on Sundays starting in April. Guests of this family-friendly winery enjoy free tours, wine tastings and bottling demonstrations, so you know you will leave with a bit more knowledge on your favorite Curling Vine drink than you had coming in. There is also a moonshine still display here, and it is open year-round, spreading the boozy-love even more. You can walk around the vineyard and tour the cellar at Keltoi Vineyard & Winery, a beautiful spot that’s located just north of Joplin. Guests enjoy sampling wines in the cottage, where they can also pick up wine and other souvenirs. Both red and white French hybrids are grown here, as well as Norton grapes. Infusing spirits is a simple way to tailor your liquor cabinet to your personal tastes while taking your bartending game to the next level. 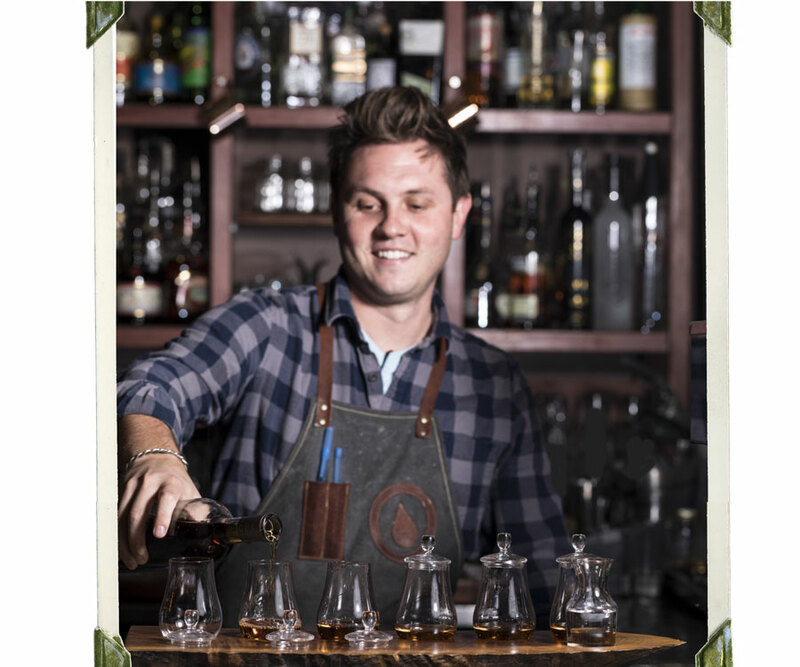 Josey Hill is the bar manager at Red Room, which is known for its infusions, and he is sharing the ins and outs of the process so you can try it at home. According to Josey Hill, any liquor can be infused, so it all comes down to preference when choosing which spirit you want to work with. Regardless of the type of spirit you select, be sure to get a bottle that is at least of middle-shelf quality. The better quality of ingredients you begin with, the better quality your final product will be. The ingredients that can be used to infuse liquors run the culinary gamut. Fruits, roots (think ginger and garlic), herbs and spices are popular choices, and the combinations are endless. When choosing ingredients it’s important to consider how the flavor of the ingredients will play off of the tasting notes of the liquor. A couple of favorite pairings of Hill are Scotch with Bordeaux cherries and tequila with basil and pineapple. Combine your ingredients and your preferred liquor in a large glass container that can be sealed. Then wrap the entire container in plastic wrap to make sure it is airtight. Store the container in a cool, dark place. Your refrigerator will work great if you have the room. To make sure the flavors of the ingredients sufficiently permeate the liquid, you want to allow the infusion enough time to steep. Porous ingredients like fruit only require about a week to infuse, whereas denser components like roots and spices need up to two weeks. Hill recommends changing out your fruit weekly, as it can eventually spoil. Once your infusion has reached your preferred flavor intensity, it’s time to strain it. Pouring the liquid through cheesecloth removes sediment and ensures clarity. Once you’ve strained your infusion, it is ready to enjoy. Serve it on the rocks or in a cocktail. One of the easiest and most classic whiskey drinks. This recipe is easily adaptable. 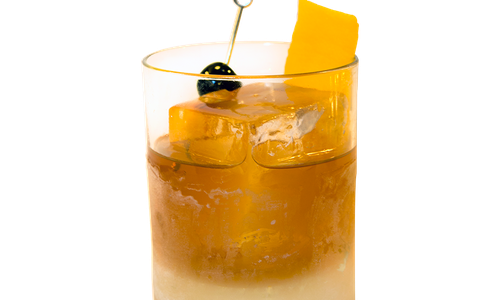 Switch out whiskey for the rum and you end up with a whiskey sour. Substitute the whiskey for vodka or gin and you have a gimlet. 417 Magazine: How did you learn to make drinks? 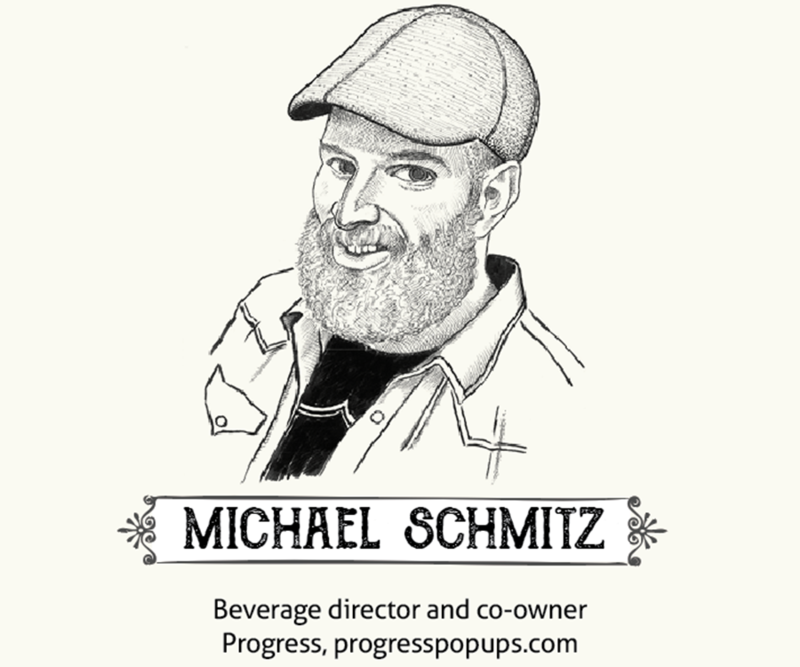 Michael Schmitz: By working in the restaurant and bar industry with talented, passionate people. I really caught the itch from Bijan’s Sea & Grille (a former restaurant in downtown Springfield) and the advanced spirit program that was in place there when I joined the team. 417: What is your signature drink, or what is a drink you like to make? M.S. 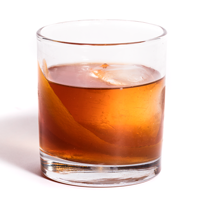 : I love the classic Manhattan, yet I also love to twist up the recipe and make a whole new cocktail. The basis of the Manhattan is whiskey, sweet vermouth and bitters, but the possibilities are endless on substitutions to one or all of the ingredients. I’ve made riffs such as a cocktail featuring gin, Italian aperitivo and grapefruit bitters that tasted nothing like the classic but was inspired by the Manhattan’s overall framework. 417: What is your favorite year-round ingredient to use, and how do you most like using it? M.S. : Vermouth/aromatized wine. I use vermouth and/or aromatized wines in a variety of ways, from displaying them on their own over a rock with a twist to using them in a six-ingredient cocktail. It’s the secret weapon. Also, bitters. All the bitters. 417: What about seasonal ingredients? M.S. : The Ozarks gives a rotating bounty of seasonal fruit, vegetables and herbs. When each come into season they are wonderful to feature! Also ginger—I love ginger. In the warmer weather, it is beautiful to bring forward its lemony, refreshing quality, and when it’s cooler outside, I like to highlight the deeper spice and warming aspects of that glorious root. 417: What is your favorite bar tool? M.S. : The jigger for sure. The perfect drink is a harmony of base spirit, acidity and sugars, and the jigger takes out the guesswork once a drink is formulated correctly. 417: What is your go-to drink when you’re not on the clock? 417: Where would you go for a cocktail when you aren’t on the clock (your own place excluded), and why? M.S. : I find myself at Lindberg’s on Commercial Street, Golden Girl Rum Club on the square, The Order at Hotel Vandivort, Scotch & Soda on South Avenue, Cherry Picker in Rountree and Barley, Wheat & Rye in Farmers Park the most. These bars share the passion, the good staff and the love that make a program fun to enjoy a beverage and good food at that! 417: If someone was looking to invest in a bottle of liquor for their own home bar, what would you suggest they buy? M.S. : Rum, all the rums. Especially Diplimatico [Reserva] Exclusiva and Foursquare Zinfandel Cask. 417: What advice would you give to someone who maybe doesn’t know how to choose a drink when they’re out at a bar? M.S. : Start with the classics—daiquiri (shaken), Manhattan, Old Fashioned, Sazerac, Margarita, French 75 or even a gin and tonic or a bloody mary, to name a few. You are bound to find one that hits your palate right. They are classic for a reason! 417: When there are a ton of customers waiting, how do you determine who to serve next? M.S. : Priority, in general, would go to first drinks ordered, yet I always have operated by the service with a “rational” decisions model. Let’s say you have 10 drinks to sling and six are beers that simply take popping a cap while the other four are cocktails that take a bit longer. I’ll get the beers in guest’s hands first. Also, if there is a line at the bar, don’t ignore the back rows—take as many orders at once as you can! 417: How do you develop new cocktail recipes? M.S. : First on paper, in recipe and usually visually with a small drawing. I draw on many aspects to kick off the creation, but my overall love to marry flavors, textures and visuals together are the basis. Second, a bit of development time to hone the recipe ratios and finalize the garnish. The final question to myself: “Is it good?” Good looking and/or inventive use of products are nothing without enjoyable flavors and aromas being there. 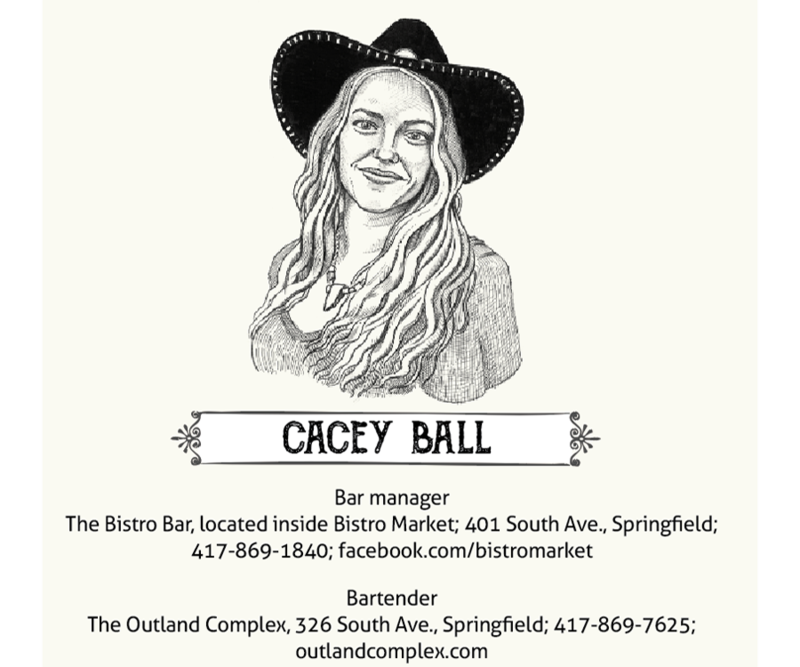 417: How would you describe the recent changes in Springfield’s local bar scene? M.S. : The Springfield bar scene has never been better. We have something for everyone and some amazingly creative, motivated individuals in the scene at the moment. 417 Magazine: How did you get your current job? Doug Riddle: First by being introduced to the Smiths through mutual friends. And second by making a mean Old Fashioned and Sazerac. 417: How did you learn to make drinks? D.R. : I bought a book called Imbibe! by David Wondrich and started making as many of those drinks as I could. Then, I started guest-bartending with friends. D.R. : For us, there are a lot of factors. Mostly it’s by time: when the ticket came across the bar. But sometimes certain orders come through that can be made quickly, despite them coming in after another ticket, so we can get them out and focus on drinks that might take more time to make. 417: What is your favorite ingredient to use year-round, and how do you most like using it? D.R. : Hands down, Rittenhouse Rye whiskey. It’s so versatile! I’ll drink it with an ice cube, shake it in a punch, stir it in an Old Fashioned, drink it out of an old shoe—whatever! our chefs influence us with things like apple butter or pear chutney. D.R. : It might be a toss up between my spanner wrench (for disassembling beer tap faucets) and a sharp knife. Both of which are absolutely essential to what we do. D.R. : Pivo Pilsner from Firestone Walker. It’s one of the best pilsners in the world, and people hardly know about it! D.R. : Think about what you like and don’t like, then be able to articulate that to your bartender or server, and hopefully they can help guide you to a drink that will suit your experience. D.R. : I believe you should diversify so the bottles last longer. Grab some Rittenhouse Rye, Plymouth Gin, Espolon Tequila and Plantation Rum (all are super affordable), and learn how to make some classics! 417: What is your signature drink or a drink you like to make? D.R. : If I had to pick one, I would say that most people who know me ask me to make them a Sazerac. D.R. : Many different ways. Sometimes we have a name that we like, and we want to find a drink to fit it, like Bingo Wings from our Fall Menu. We wanted a drink that would make someone shout, “Bingo!”, so we worked toward that. Sometimes drinks come from ingredients we need to use before they go bad. Sometimes we have a drink at another bar and get an idea for a riff on that, etc., etc. Once we have an idea, we throw out ratios that make sense to our intuitions, discuss, make the drink, drink it, discuss, then re-do. 417: Where would you go for a cocktail when you aren’t on the clock (your own bar excluded), and why? D.R. 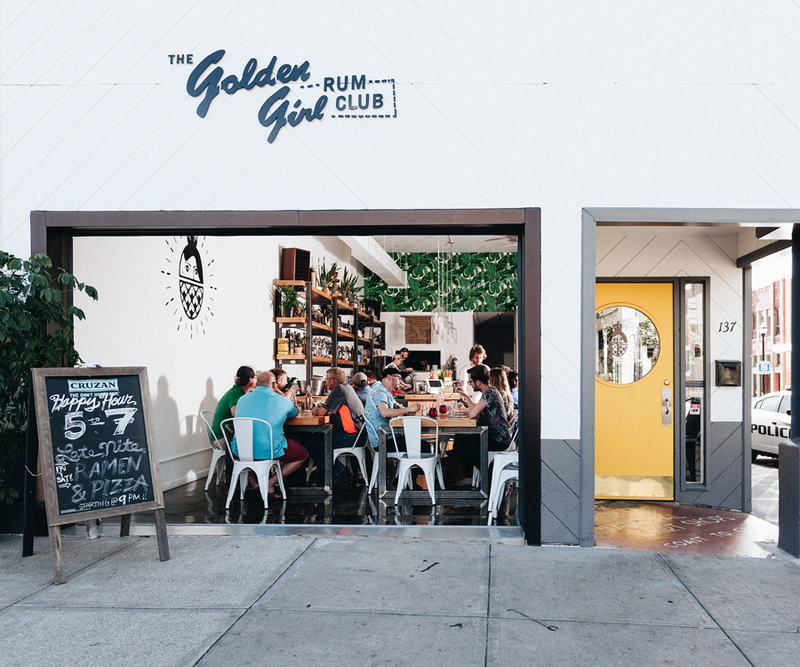 : Right now I’d go to Golden Girl Rum Club for a High Life and a pour of aged rum. D.R. : Exciting, and also, a long time coming. 417: Any other words of wisdom for our readers? D.R. : Don’t drink in just one place. Talk to your bartenders. Be curious. Try new things. Take chances. Rogan Howitt: I guess I started learning from family—it seems like my dad probably piqued my interest in actual cocktails. I started working at MudLounge 11 years ago. I barbacked, then tended, eventually convincing them to let me do a “classic cocktail” menu on the Mondays I was working. Nobody was really into that type of cocktail in Springfield at that moment. Bodega Bar and Agrario had left the scene, and I’m pretty sure we were the only bar downtown with a “cocktail program” other than classic martinis, shots and mixed drinks. I am mostly self-taught/trained. 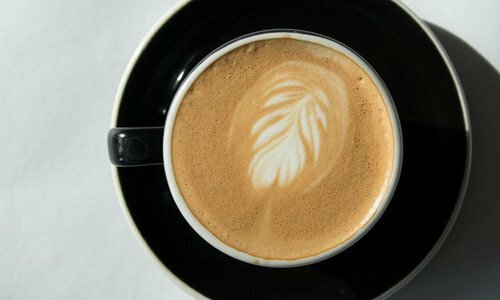 417: What is your “signature drink” or a drink you like to make? R.H.: The Mai Tai. Sadly, this is a drink that’s been wildly bastardized over the years. We all know the name, but I doubt many people are familiar with the actual recipe for this classic. Traditionally, the Mai Tai is a strong, lightly sweet, tart and even savory cocktail using rum, lime, orange liqueur and Orgeat (a common ingredient in many rum/tiki cocktails made usually from almonds, a couple liquors and rose or orange flower water). I probably suggest this drink at Golden Girl more than any other cocktail. Most of the people who come in the bar haven’t had a proper Mai Tai in their lives, and I want to show them just how perfect it can be. 417: Where do you go for a cocktail when you aren’t on the clock (your own bar excluded), and why? R.H.: It’s funny, but I crave frozen margaritas—good ones. As of now you can find me at Cesar’s Old Mexico at least once a week, specifically to eat tacos and drink a margarita. Scotch & Soda, on the other hand, will make the best classic cocktail in town. R.H.: It’s a delight. I’ve watched it grow into something competitive and noteworthy. 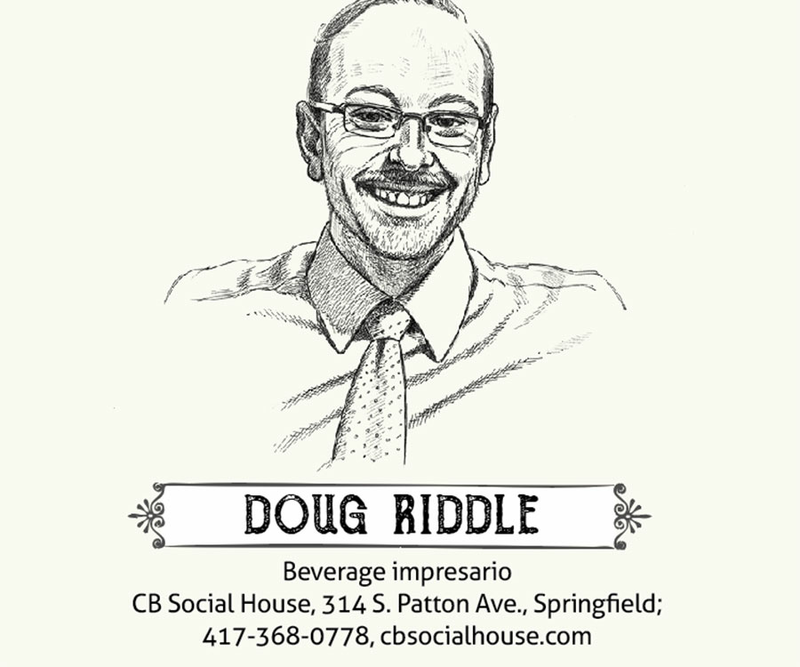 These are both important aspects of community Springfield has needed to advance not just cocktail culture but food and art culture in the Midwest. R.H.: Start with a concept, flavor or ingredient that you want to feature or highlight. Try many different variations on what you are trying to make. Even if it’s just a quarter ounce of this or that, it can completely change your cocktail. Don’t settle for pretty good. I want my cocktails to be balanced, interesting and memorable with minimal fluff. Fluff can be fun, though. It can be the extra element that makes your cocktail work. R.H.: This Hamilton Beach commercial milkshake mixer we have. We mix a good portion of our cocktails in it. We also have two ice machines—one with large cube ice and a smaller nugget ice maker for tiki-style cocktails. These three items are crucial to our bar program, and I’m pretty sure they are all exclusive to Golden Girl. R.H.: Usually a Fernet-Branca or an inexpensive but quality rum, and a tall boy of High Life. R.H.: Who is next in line, and who isn’t waving money at me or yelling, “Hey, bartender.” I guess I always look for the polite ones. R.H.: Falernum is one of the many house syrups I make for [Golden Girl]. It’s another classic Tiki/rum ingredient made from almonds, clove, ginger, lime zest, rum and sugar. It’s by far the most laborious syrup I make. It’s truly a magic ingredient that you won’t be able to find anywhere else but Golden Girl. This is part of what sets us apart. Because we make our own syrups, our flavor profiles are specific to [us]. I have near 20 homemade syrups for the bar, including multiple Orgeats, spice-based syrups, fruit syrups and some savory mixtures. 417: What about seasonal ingredients? Do you have any favorite seasonal ingredients, and if so, how do you like to use them? R.H.: Seasonality is crucial to any bar program. We are getting ready to roll out some fall and winter cocktails—stronger spirit-forward cocktails with less emphasis on summer fruits. There just comes a time when we can’t drink as many piña coladas as we could during the summer. In July, it was an absolute necessity, but in January they will be an occasional treat. Short, strong celebratory drinks are what are perfect for the winter. Rum-based for the most part, but we will be playing with plenty of amaros and even some whiskey, too. R.H.: Have an idea of where you are. If you’re at a dive, order a beer, mixed drink or a shot. If you’re at a cocktail bar, talk to your server or bartender—they are your guide. If you’re at a rum bar, don’t order a whiskey—play along and order a rum drink. Most bars should have a something they are good at. If you can’t pick up what that is, ask an employee. R.H.: If I have learned anything behind the bar it’s that price or age of a bottle isn’t everything. Actually, it doesn’t mean much at all. There are some basic rules that should be followed: no flavored liquors, nothing spiced and nothing by the handle. It’s up to each person to try different spirits and find what you like the most. Your taste will change over time. Find a spirit you would like to learn about, start affordable and move up from there. 417: What other words of wisdom do you have for our readers? R.H.: Don’t be afraid to try something new, something you’ve never heard of or something that sounds strange. A good bar will have cocktails in all of these categories. A quality bar will have tested their recipes over and over and decided on an end result for a reason. I know if I’ve come across something good if I take a drink, and it immediately puts a smile on my face. There’s no such thing as a “manly” drink. Our community still has plenty to learn in that respect. Just because there’s fruit in a cocktail doesn’t mean it’s not as strong as an old fashioned. At my bar, it’s just the opposite. 417 Magazine: How would you describe the recent changes in Springfield’s local bar scene? Cacey Ball: We’ve had some really great new bars pop up in the last couple of years. Springfield is catching up with bigger cities as a place where you now have multiple options of cool bars to visit and enjoy a craft cocktail or beer. CB Social House opened this past year, debuting a talented bar staff and super-innovative cocktail menus. 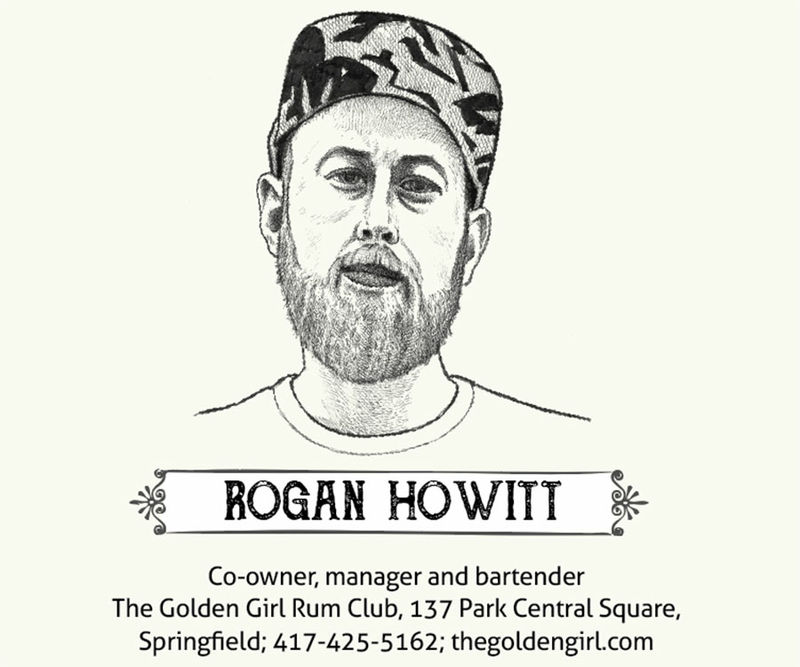 You have bartenders like Rogan over at Golden Girl Rum Club pumping out some of the best tiki drinks I’ve ever had, without a tropical coastline in sight. These kinds of things are what help to increase public interest in cocktail culture and why our bar scene will only continue to grow with these creative individuals stepping out. I’m just stoked to see what the future holds! 417: What is your signature drink? C.B. : Over the years I’ve had several “signature” drinks, but I’d say the most significant to me is a drink I made a few years back called The Kenny. It incorporated a couple choice spirits of a friend and regular customer of mine that left us before his time. It was nothing groundbreaking as far as cocktail making goes, but I make it with extra love, and it’s a special feeling when his friends still come in and order it. I really like getting people to try new things or cocktails that I’ve personally created, but when I serve a Sazerac it’s like I’m also giving out this subconscious fist bump. 417: What bottle of liqueur should every home bar have? C.B. : I think it’s always nice to have a good bottle of Scotch to dip into from time to time, especially in the winter months. If whiskey isn’t for you, invest in a high quality version of your favorite spirit. You should definitely spend the most money on something you will enjoy. C.B. : I’m a little bit of a cocktail chameleon, and I love trying new things, but bourbon, scotch and beer always hit close to home. Now read that in a George Thorogood voice. C.B. : When I started working at The Outland I had almost zero knowledge of what went on behind a bar, but I did have a genuine interest to learn and absorb all the information I could. I remember the first time I expressed interest in learning to tend bar I was given an empty 750 milliliter bottle and pourer and was then told to go home, fill the bottle up with water and practice my “pour count.” This requires practicing counting in your head while pouring a shot, which develops a skill of being able to “free pour” specific ounce measurements without using a jigger to measure. Although The Outland was more cracking beers and slinging whiskey shots than assembling classic cocktails, working behind the bar in general sparked an eagerness to expand that skill set. I already had a love for cooking and experimenting with flavors, and as a curious person by nature, I began reading and researching about cocktail culture and the history of bartending. From there I started working at the Bistro Market Bar, where I was able to start executing some of the ideas and knowledge I had acquired, as well as, experimenting with new and different spirits, produce, and other ingredients. 417: What’s your favorite ingredient to use year-round? C.B. : In the colder months I tend to gravitate towards bolder flavors. Right now I’m experimenting with different Rock and Rye variations, which incorporates dehydrated stone fruits and pie spices infused into rye whiskey. In the warmer months I tend to make more shrubs, utilizing the abundance of in-season produce to add bright fresh flavors to summer drinks. Shrubs are so fun and easy for anyone to make (like, sooo easy), and you can also use them for cooking or homemade sodas. Basically you’re just cold macerating fruit or other produce with sugar, adding vinegar, letting it set a bit, and straining. Get creative. Add herbs. Add Spices. Have a party! Make a shrub. 417: What’s your favorite bar tool? C.B. : A shaker and a good tune. 417: What advice would you offer to someone who isn’t sure how to choose a drink when they’re out at a bar? C.B. : Be adventurous. Personally, I have found so many things that I never knew I loved by making a conscious effort to try cocktails or ingredients that I’d never heard of or had before. 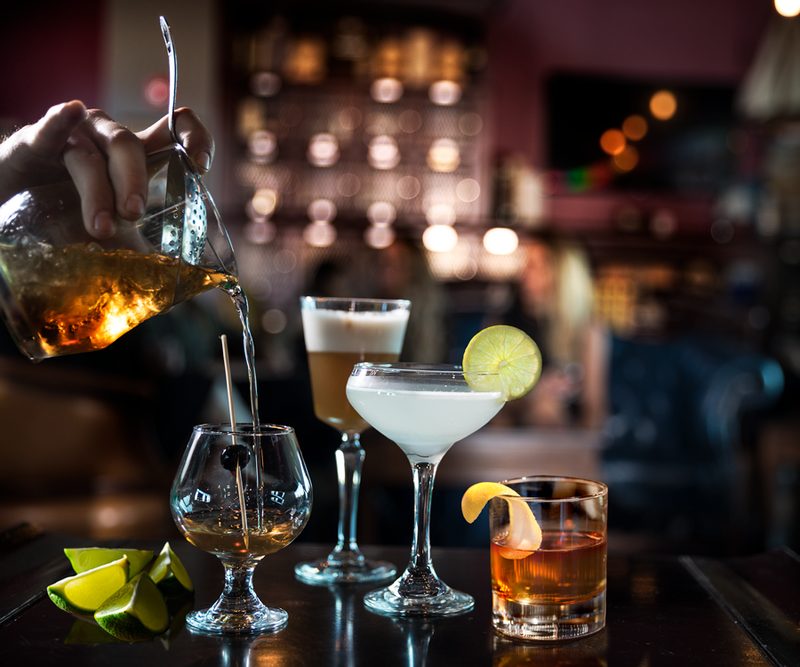 If you’re not feeling like branching out too far, tell your bartender what you usually gravitate towards and we can help you decide on something you will enjoy. The cocktail world is vast and wide, and variety truly is the spice of life. C.B. : I try to be pretty diplomatic and go in order of who came to the bar first. Busy nights can get a little chaotic when there’s a ton of people standing around the bar, so patience is always appreciated. Also, having a general idea of what you want to order helps the process. It’s definitely not my favorite thing to be whistled or shouted at, so general politeness can always get you a little further, as it can with about anything. C.B. : New ideas come from all over the place. I’ll come across a flavor combination while cooking that I think I can implement into a cocktail. I may be inspired from drinks that I’ve tried while traveling, or I’ll just randomly come up with an idea. If I think I’m onto something good, I’ll ask for feedback from a coworker or customer. Sometimes I’ll fail miserably, tweak the recipe and be satisfied, or hit a home run. It’s all about trial and error. 417: Where do you go for a drink when you’re not on the clock? C.B. 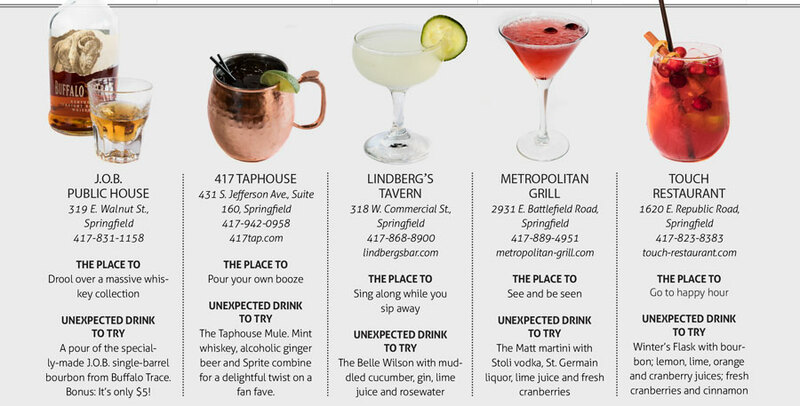 : Lindberg’s and JOB Public House are some hot spots for me. Aside from having great staff, the dudes that have developed these bars are passionate about what they do and lending to our local bar scene. JOB has a great whiskey selection, late night eats (those pizza balls till bar close—HELLO! ), and you can actually sit and have conversation while expanding your bourbon knowledge. Lindberg’s has such a chill vibe, cool bands performing and phenomenal food and drinks. You really feel like you’re leaving with a little piece of Springfield history after a night at Lindberg’s. 417: How did you get your current jobs? C.B. : I love music, and The Outland was always one of my favorite venues to hang out at and catch live shows. I eventually talked the bar manager into letting me barback in exchange for teaching me some tricks of the trade. When I first came on, the other employees had been there for a number of years, and the bar was fully staffed, so I wasn’t expecting to actually be hired. When I had finally picked up some general knowledge, I was given a few shifts at the small, cash-only satellite bar that we opened on busy nights. That just kind of segued into a bartending position, and I’ve been there ever since. A couple years later I acquired my job at The Bistro Bar through a friend I had made at The Outland. My co-workers have become more like family members. Shout out to my work families! 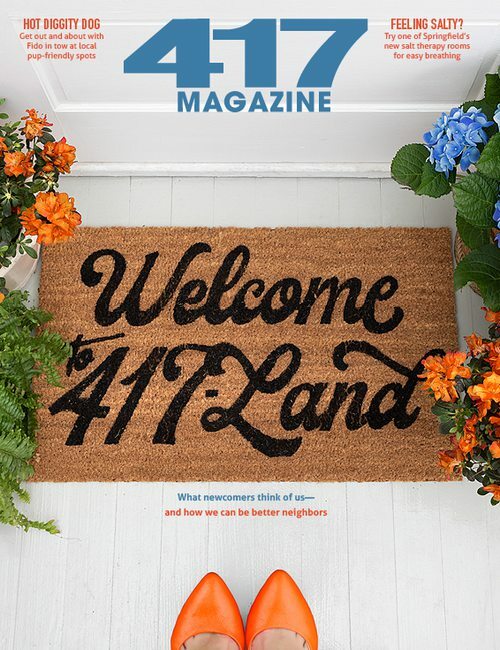 417 Magazine: How did you first learn to make drinks? 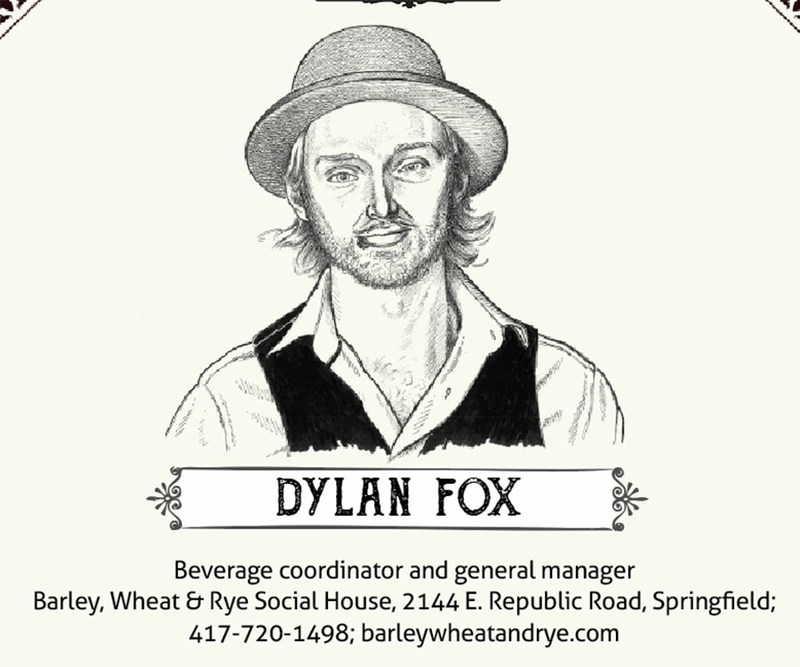 Dylan Fox: Well, that’s a pretty long story, really, but to make it short: I was a barback for a couple of years at a bar downtown, so I watched and learned a lot just from that. Then, I became a bartender, and man was it terrifying being behind a bar with an expansive inventory of multiple kinds of spirits. So then I started reading books and doing my best to learn from every encounter with guests and fellow bartenders. D.F. : Typically I have either an idea for a style of cocktail or I simply have found a new spirit or seasonal ingredient that I want to incorporate. Then, I start making the drink, smelling the ingredients and deciding what to throw in along the way. Last, I always have my team here taste it, and they know I want an honest opinion. If it’s bad, I start over or put the idea aside for another day. If it’s good, then I get to come up with some nerdy or witty name for it. 417: What advice would you give to someone who maybe doesn’t know how to choose a drink when they’re out at the bar? D.F. : I would suggest going to a reputable bar on a slower night or time of the week, plopping down at the bar and telling your bartender what you like. A good bartender should be able to work through several options based on the flavor profiles or the spirits you enjoy. Then, you can have a go-to any time you go out. 417: How would you describe the recent changes in Springfield’s bar scene? D.F. : The changes have been quite drastic since I started bartending just four and a half years ago. Scotch & Soda opened up around that time, and since then Springfield can’t seem to get enough. 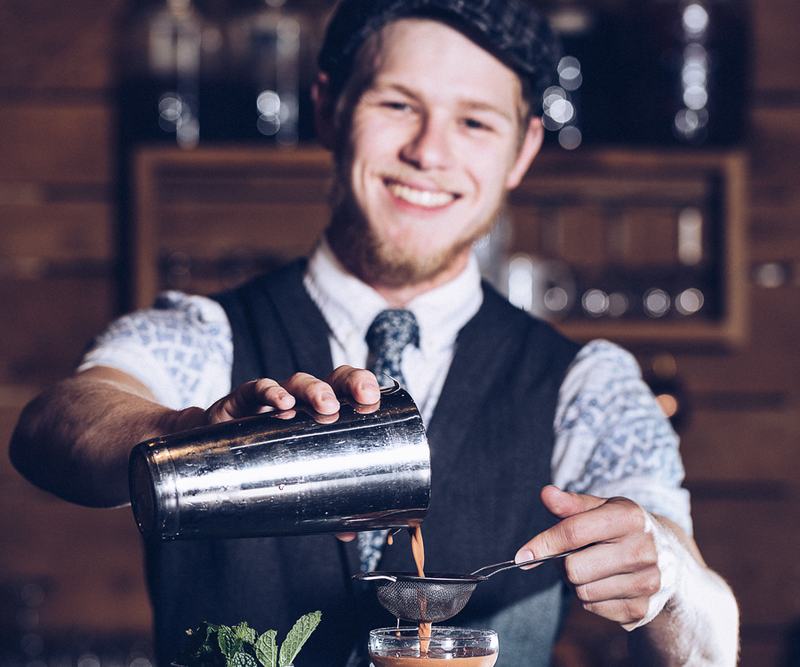 Now we bartenders are really stepping up our game, not only in terms of showmanship and vastness of the drinks we can create but also in terms of hospitality and what it really means to be a bartender. D.F. : I try to motivate my staff to always do their best to serve our guests in the order they arrive. Now, when there are 100 people crammed into the bar, it gets a little harder to do. so, it usually ends up being the most polite and respectful guests who make eye contact while we are throwing things around. D.F. : It very much depends on the place and time. At home I like amaro neat. If I’m out at one of my favorite spots (this would mean I trust the bartenders), then I’ll let them make me whatever they’re excited about making that night. If I’m at a bar I’m unfamiliar with, I usually drink cognac, rum or whiskey neat (you simply can’t get that wrong). D.F. : That would really depend on what they like to drink. I could give them a small grocery list of bottles I think they need if they want a functional home bar, but it’s not just one bottle, though. I would tell them to buy a bottle of bitters (yes, it is considered a non-consumable, but most are made with a fairly high proof spirit). Then you would almost have to buy other bottles to make some good ol’ classic cocktails. D.F. : Definitely amaro. I use it in almost anything in place of vermouth, bitters, sweetness, savoriness, and in some cases acidity. There are just so many different kinds out there. D.F. : I love anything that our kitchen downstairs will let me get my hands on. It can be kind of tough to implement fresh ingredients like berries or herbs on an everyday menu because of variance in product, although we do our best to implement them whenever we can. Otherwise I like to make shrubs (sugar and vinegar maceration) or syrups out of them and store them for future use. I can make large batches, and they keep almost indefinitely. D.F. : It’s hard to say since one without the other is usually useless behind the bar, but if I had to pick one it would probably be my mallet for crushing ice. Nothing turns heads in a bar like the bartender taking out some aggression on a bag of ice. D.F. : Honestly, any of the awesome craft bars in town (not that I don’t love my dives, too). But I almost always hit up Scotch & Soda. They understand how to make a complex cocktail, or just pour me a glass of amaro. 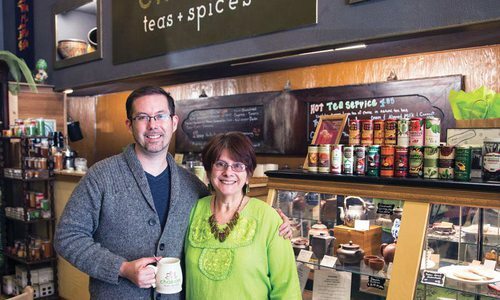 Chabom Teas + Spices on Commercial Street brings 417-landers a wide variety of products from all over the world.